Meeting at St Mary’s Chapel, The Hill, Langport, TA10 9QF. 18.30 on the third Tuesday of February, April, September and November (Installation). The Lodge has 40 subscribing members. The 2017 Installation was a special evening for Portcullis Lodge because non other than the Lodge Chaplain W.Bro Barrie Baker Provincial Grand Senior Warden represented the Provincial Grand Master. David Rockey was Installed by WBro George Small in a very capable manner. W.Bro Tony Guthrie Provincial DepDC assisted the ceremony and in particular the ProGSW. It was also a first for Portcullis because due to the sale of the Langport Arms they now meet at the Black Swan for their festive board, the quality, quantity and service proved excellent. The photograph above from left to right shows: Tony Guthrie, Barrie Baker, John Smith PGJD, Andrew Barrett (SW), David Rockey (WM), Mike Johnson (JW), George Small (IPM), Colin Neagle - Proincial GStwd, Steve McNaughton - Provincial Asst DC and Ken Crang - Provincial Dep Chaplain. February 2016 - Presentation to PGM’s Hope for Tomorrow Appeal. At the meeting of Portcullis Lodge of MMM No. 1656 meeting at St. Mary’s Chapel, Langport on Wednesday 16th February 2016 W. Bro. Ian Moore, Provincial Grand Inner Guard, presented a Cheque to the PGM for the ‘Hope for the Future’ appeal for the sum of £650. The money having been collected at the funeral of Ian’s father, Bro. John Moore, also of Portcullis Lodge No. 1656, after his family had expressed a wish that the collection would be for the above appeal. Also present in the picture are, W. Bro. Terry Wood who was part of the delegation from Fidelity and Unanimity Lodge No. 348 who were there to present the Travelling Keystone, and W. Bro. Steve McNaughton, Master of the lodge. Feb 2014 - Brother John Moore was advanced into Portcullis Mark Lodge on his 80th birthday by Ian, then the Master of the Lodge. The photo shows John proudly wearing his Mark Master Masons apron and his 80th birthday badge! Installation of Allen Day as Master. In the photo back row Left to right, David Nelson PGM, Alan Helliar JW, Allen Day WM, Ian Moore SW, John Morgam DPGM and Mike Gagg Prov Deputy Chaplain. Front row Terry Haggett Prov Grand Charity Steward, David Lyons Prov Grand SW, Derek Wilton Dep Grand Sword Bearer and John Vowles Prov Grand Inspector of Works. It was another good Portcullis night! Having completed two very good years in the Chair of the Lodge, W Bro John Vowles installed his successor Ken Gillard in fine style. It was a good ceremony well attended with many Provincial and Grand Lodge officers present and no less than five Masters of other Mark Lodges in the Province. The Deputy PGM, Ray Guthrie was thanked by the Master for his help and guidance to members of the Lodge during his term of office as Deputy PGM. In addition to those officers moving on the progression the Master appointed Malcolm Head as Registrar and Barrie Baker takes over from Richard Francis as secretary. At the end of the ceremony the Lodge iPod technician - Barrie Baker played "We'll meet again" as the Master and Deputy PGM left the Lodge, no doubt we will! In the photo from left to right, Graham Gamble -Provincial Deputy DC, John Morgan - Provincial Secretary and Provincial Deputy PGM designate, Ray Guthrie - Deputy PGM, Allen Day - Senior Warden - Ken Gillard - Master, Ian Moore - Junior Warden, David Bates - Provincial Steward, Andy Gray - Provincial Assistand GDC and Richard Gale - Provincial Junior Grand Deacon. AN ENCORE FOR JOHN VOWLES ! 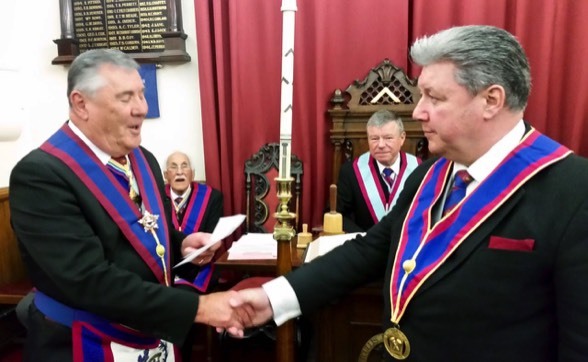 WBro John Adrian Vowles was proclaimed as Worshipful Master of Portcullis Lodge for a second year. Seen here flanked by his Wardens, Bro Ken Gillard and Allen Day and in the company of RWBro David Nelson and the PrAGDC WBro Mark Golding. Following the resignation of the Senior Warden, John volunteered to undertake another year as Worshipful Master but it was very gratifying to know that had he not wished to continue four past masters of the Lodge had also offered to step in if required, an indication of a very successful Lodge. Following his Proclamation by WBro Frank Parsons the Worshipful Master invested his officers with dignity and humour. During the ceremony the lodge voted to distribute charity money to local Charities in and around Langport. Portcullis Lodge proudly exhibits its new banner in the Hanging Chapel at Langport. The late VWBro Tubby Godfrey with the assistance of the Lodge Secretary, Barrie Baker and the the late RW Bro David Palmer produced a simple design for the Portcullis banner. Unfortunately shortly after the banner had been designed to Tubbys approval (subject to some frilly bits) he became ill and the project was put on hold until the Lodge was asked by the Provincial Grand Master, RW Bro David Nelson to host the Provincial meeting at the Webbington Hotel. The Lodge Secretary WBro Richard Francis took up the baton and a committee meeting was soon held, the banner design approved and the money raised. The cost of the Banner was met by voluntary donations from the Lodge members and the making of the Banner commissioned. The Lodge is extremely grateful to WBro Bill Lanfear for making the woodwork that supports the banner. The design brief by VWBro Tubby was to keep the banner simple, to reflect the fact that it was now 2008 and to be able to tell it was a banner of a Mark Lodge but still to have a bit of frilliness about it. The banner shown in the photograph meets all of these requirements. It was first used at the 2008 Provincial meeting at the Webbington Hotel (only having received it from the manufacturers two days earlier). However the September meeting of Portcullis Lodge saw the entire Provincial team (well almost the entire Provincial team) and many visitors packed into the Hanging Chapel. After the Worshipful Master WBro Barrie Baker had advanced Bro Andrew Strain the Provincial Grand Master accompanied by the Deputy Provincial Grand Master carried out the Banner Dedication Ceremony. The Provincial Chaplain WBro Les Downs read a wonderful oration of the Lodge history. “a commission was held in Langport Church in 1317 about the appointment of a head of Cannington Priory and about this time, the Hanging Chapel was built. It was in existence before the manorial Accounts of 1344 and was then called the The Building described as the ‘Hanging Chapel’ was used as the Town Hall between 1547 and 1600 and in 1596 reference is made to the ‘”own Hall commonly called the ‘Hanging Chapel’, which the whole town of Langport so use the said Chapel for a place for consultation about such causes as they have in hand”. It was handed over to the school about 1706 and continued as such until 1790. From 1809-1816 it was let to Colonel Pinney for the local militia to use as a store. In 1827 it was let to Mr Burt for £3 per annum and in 1843 ‘ the east and west guard walls were rebuilt’ and at this time, ‘the fire engine was stored in the Chapel Gardens’. In 1843 it was let to Mr E Quekett for a museum and in 1891 it was let to the present occupants, The Portcullis Lodge , who are responsible for the repairs. On the 26th July 1988 Portcullis Lodge of Mark Master Masons No 1656 held its first meeting in the hanging chapel and are the only Lodge in the Province who can truly say “that they meet over the road”. Langport Masons remember the fallen.